out as CBers and a lot still operate there. This was my first mobile radio in my first car a 1956 Chevy Belair. 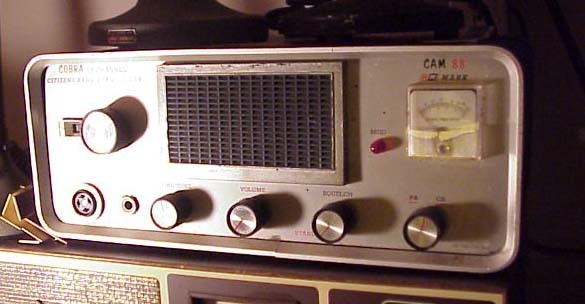 A Cam 88 like this was my first base station radio. I got it for Xmas when I was a Junior in high school. This is not the same radio. with the push to talk button mounted on the front panel. A really well built set, very heavy. Note that the transmit and receive crystals are set separately. I don't know the model number of this radio.. This radio was given to me by an old guy in Charlotte, he said it was dead and maybe I cold use it for parts. someone likely tried to hook up 12 volts backwards. Installed a new diode and it worked great. they first came out, I thought it was a really cool looking radio. A Whiteface like this one was the first real CB radio I ever saw. It belonged to my surgate grandfather. He had one in their living room next to his chair and one in his 1960 Cadillac Sedan deville. Johnson also made a 10 meter version of this radio. Had a single crystal socket, on the chassis inside the cabinet. A lot of them, like this one were modified to have a crystal socket on the front panel. one for the 2 meter band was called a 2er. the 10er was for the 10 meter band. 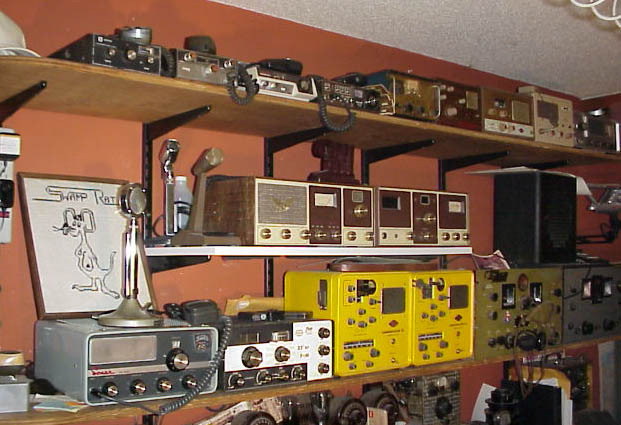 These are all AM and they all work, several of us used to get on 2 meter AM, or 6 meter AM, it was fun. Some of the CB collection is on the top shelf on this wall in my office/hamshack. The second shelf down holds my Golden Eagle Kark IV. Sitting on top of the Eagle you'll see a dark red wooden number that says 9111. It was one of my sideband calls, it was issued by the Southeastern club the full numbers were SE-9111, one of my best friends back then, Ronnie Whilden who made me the numbers in his woodworking shop. Clegg 22er FM, a tube type 2 meter FM rig. one 2 meter and one 6 meter. Next to the right is a Hammarlund BC-779A VLF receiver, covered 100zhx - 22 mhz. HQ-129X with the Hammarlund speaker on top. to the rest og my life, "click" on the gray button below. 2 receive crystal positions plus tunable receive. thing better was a Tram or a Golden Eagle. 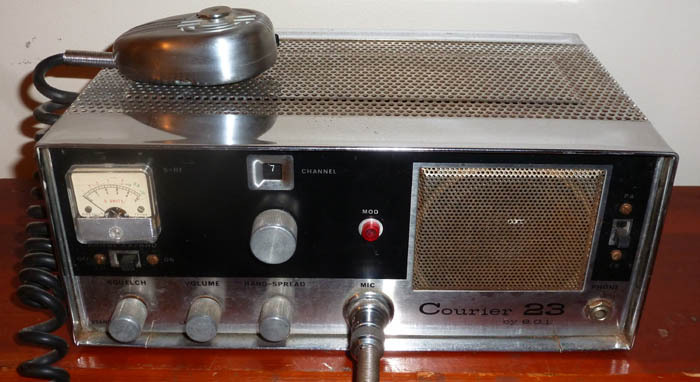 This is one of those dream CBs, seperate transmitter and receiver, with matching desk mic. base station. You can program memory channels, scan for busy or open channels. With matching desk mic. I also have another 459 in the original box and a factory service manual for it. It's a 12 channel base/mobile.